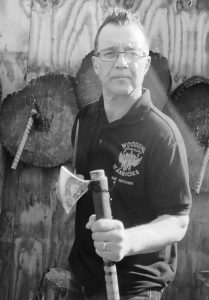 My first introduction to knife throwing was in August 2016, a weekend trip to Woodend Target Sports in Huthwaite for an Archery lesson led me to ask about the painted wooden targets hanging on the wall of the indoor throwing range. Daniel Mosley gave me a quick run down of what happens and when, so the following Wednesday I took myself down and had a go. Needless to say I was hooked. I threw anything and everything I could get my hands on from 12″ nails to garden tools. I am truly passionate about this sport and truly enjoy watching other new throwers progress. In September 2018 I took over from Dan and became the Rangemaster at Woodend.